Lace Fence by young Dutch design team Demakersvan is going into production in India. The design, which was one of the highlights at Milan last year, is to be produced by ID Fence of Bangalore. 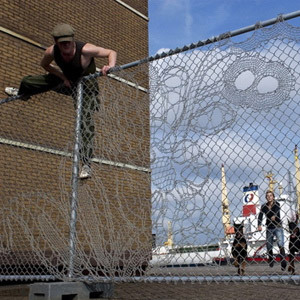 Lace Fence was designed by Demakersvan's Joep Verhoeven in 2005 when he was still a student. It was part of his graduation project at Design Academy Eindhoven and exhibited at the academy's show in Milan during the furniture fair in April 2006. Based on factory-made chainlink security fences, Lace Fence contains decorative elements based on traditional lace patterns. This mixing of industrial and craft references is a common theme in contemporary Dutch design.